^ Maloof, A. C.; Porter, S. M.; Moore, J. L.; Dudas, F. O.; Bowring, S. A.; Higgins, J. A.; Fike, D. A.; Eddy, M. P. The earliest Cambrian record of animals and ocean geochemical change. Geological Society of America Bulletin. 2010, 122 (11–12): 1731–1774. Bibcode:2010GSAB..122.1731M. doi:10.1130/B30346.1. ^ New Timeline for Appearances of Skeletal Animals in Fossil Record Developed by UCSB Researchers. The Regents of the University of California. 10 November 2010 [1 September 2014]. ^ Valentine, JW; Jablonski, D; Erwin, DH. Fossils, molecules and embryos: new perspectives on the Cambrian explosion. Development. 1999, 126 (5): 851–9. PMID 9927587. ^ Budd, Graham. 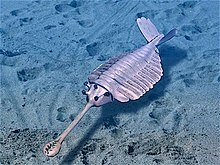 At the origin of animals: the revolutionary cambrian fossil record. Current Genomics. 2013, 14 (6): 344–354. PMC 3861885. PMID 24396267. doi:10.2174/13892029113149990011. ^ Erwin, D. H.; Laflamme, M.; Tweedt, S. M.; Sperling, E. A.; Pisani, D.; Peterson, K. J. The Cambrian conundrum: early divergence and later ecological success in the early history of animals. Science. 2011, 334: 1091–1097. Bibcode:2011Sci...334.1091E. PMID 22116879. doi:10.1126/science.1206375. ^ Kouchinsky, A., Bengtson, S., Runnegar, B. N., Skovsted, C. B., Steiner, M. & Vendrasco, M. J. 2012. Chronology of early Cambrian biomineralization. Geological Magazine, 149, 221–251. 派克 著. 《第一隻眼的誕生：透視寒武紀大爆發的祕密》. 陳美君 中譯. 貓頭鷹出版. 2010. 史蒂芬·古爾德 著. 《達爾文大震撼：課本學不到的生命史》. 程樹德 中譯. 天下遠見出版. 2009.